The Ascend Acoustic Sierra-1 monitor is a beautiful bookshelf speaker that can roar like a beast when it wants to. I say that because it is and frankly, thatâ€™s what it does best. But before I get into explaining the details of what one can expect, it should be known that David Fabrikant, the designer and head honcho of Ascend Acoustics, spent 4 and a half years developing the Sierra-1. David wanted to offer a truly reference-quality monitor that was neutral, linear, and had what so many monitors of its size lack, bass. And, he wanted to accomplish all this at an affordable price point. Since taking over as the editor and site manager for AudioReview.com I have been keenly aware of this great looking speaker in our Hot Deals section that, if it sounded as good as it looked, could surely be nothing short of a bargain. The base Sierra-1 with no fancy finish sells for $848, which meant the natural course of action was to email David and ask for a review sample for the Audio Review â€œSub $1000 bookshelf Speaker Reviewâ€ series. So I did and David was nice enough to not only supply me with a pair of Sierra-1 monitors, but to supply me with a set that has a finish that knocked my socks off. 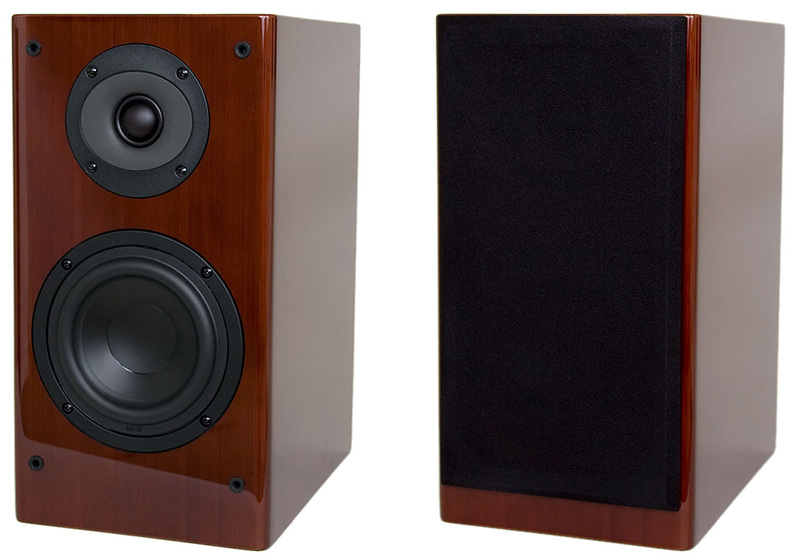 The Dark Cherry finish option placed the speakerâ€™s price at $948. When the double cardboard and impact foam packed speakers arrived I was expecting a good looking monitor to come out of the box, however, when I opened the box and found a pair of white gloves I knew something was up. White gloves tend to imply that the content is extraordinary but when I took the deep reddish maroon speakers out of the box I thought for a second Iâ€™d been sent the wrong unit; something wrong because it had to cost four or five thousand dollars. The look and gloss finish are simply stunning. Iâ€™ve seen a lot of finishes at shows, but off hand I canâ€™t remember anything that was under $4k that looked this good. The fact that the speakers are made of layered bamboo only made the deep gloss red all that more seductive and unique. David chose to make the Sierra-1â€™s from bamboo instead of MDF board because of its extreme rigidity. For the speakerâ€™s purpose the bamboo is better material because it is superior at controlling cabinet resonance due to its supreme rigidity. I read in one review of the Sierra-1 where author proposed that the bamboo cabinet of the Sierra-1, size wise, is structurally stronger than a version made of steel. And you know, I donâ€™t doubt it. Remember Samurais used steel blades that were folded many more times then their European counterparts, but they wore treated bamboo as protection as opposed to metallic alternatives. Iâ€™m not saying you should use a Sierra-1 as armor, but the rigidity of the speaker is well above what you typically find at a sub thousand dollar price point. As well, the speakers have good weight to them. If there is any cabinet resonance, Iâ€™d bet a left pinky it couldnâ€™t be heard. David specially sourced 26mm soft dome SEAS tweeters to have a wave guide construction that controls dispersion and reduces diffraction. A 5.25â€ long throw mineral-filled PP woofer with a polypropylene rubber surround and aluminum chassis, that has a large amount of extension to it (which means it can push a lot of air), is crossed over at roughly 1800kHz. The rear port is custom tooled to allow for high air flow. David designed the OPPIX cross over, which stands for Paradromic Phase Integrated X-Over. That uses a variable slope cross over to align the acoustic phase response of the speakerâ€™s transducers. The point is to create a coherent image from the speakers that sounds like the music is coming from one source. Ascend Acoustics also hand matches and pairs every set of drivers and each set of the Sierra-1 speakers come with their very own frequency response curve graph. I would like to point out some thing about the 5-way binding post of the Sierra-1. They are laid out by a man deserving of praise for forethought and care. They are spaced several inches apart making cable switching a thing of ease. I know this may not be that big a deal for everyone, but I do a lot of cable switching, and it was a rare treat to not have to squeeze my large fingers into a miniscule box with tiny 5-way binding posts that are difficult to adjust. Thank you David for these easy to access, large, and user friendly binding post. I have to say, I’m impressed. A review about speakers with die-hard fans which managed to remain unbiased. Its actually a little refreshing to hear that these speakers *do* have some shortcomings, since every speaker does but nobody seems to point them out with the Sierra reviews. I was very surprised to hear that the bass sounded… off? Also for the record, bamboo indeed has a tensile strength greater than steel. The fact that basic bamboo looks good and is the most renewable “wood” on the planet makes them all the better.